Sleepy Hollow until recently was one of the lucky few shows on television which had managed to get a great twitter following. Why, you ask, is this important? Well, if people are tweeting about your show, not only are they actively engaged, they are advertising for you free of charge. The problem, however, with having a good social media presence is that you cannot control the message. Black twitter, once a strong social media fanbase for Sleepy Hollow, recently had much to say about how the characters were being portrayed and the direction the storyline has taken. Using the twitter hashtag #AbbieMillsDeservesBetter and #cranewreck, they vocally displayed their displeasure with the reduction of the once prominent characters of colour to instead feature the relationship drama of Ichabod and Katrina. What initially drew many people to Sleepy Hollow in the first place was the racial diversity of the cast. I know that the British with their air of superiority over those snooty accents being reduced to demons of the apocalypse sounds like it’s cool but trust me, it was the racial diversity. Sleepy Hollow was largely sold as an ensemble cast featuring Lt. Abbie Mills, Frank Irving and Ichabod Crane, with various characters of colour taking on a supporting role. 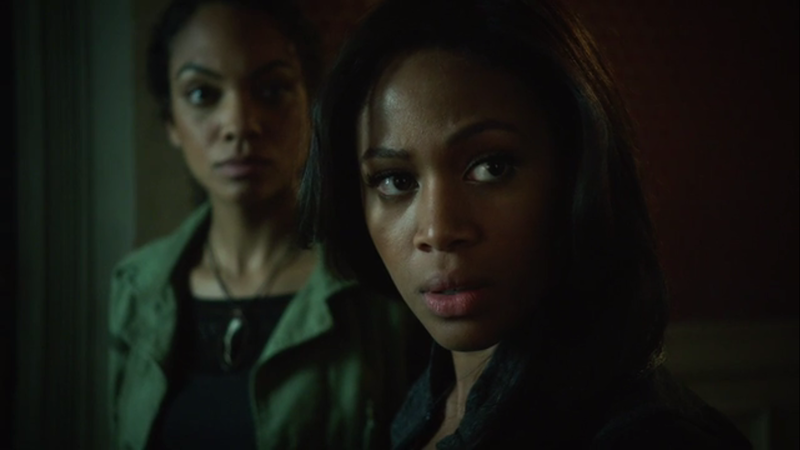 Sleepy Hollow further stood out by having equality between the characters. Lt. Abbie Mills and Ichabod were a true partnership and once Frank and Jenny found out what was going on and agreed to help, they filled out the team. These characters were not cardboard cutouts and had well established backstories. Sleepy Hollow suddenly became must see tv based largely on its racially inclusive nature. You would think that with this successful formula, in an age where network television is struggling thanks to HBO, Netflix, Hulu and other online programs that Sleepy Hollow would ride this all the way to the bank, but alas, it seems that is not the case. Since the second season began we have seen a strong step back from the racial diversity that so characterised the first season and engaged so many fans. In particular, Abbie has been greatly reduced this season to increasing fan disappointment. This came to a head in the latest episode where Katrina had her demonic pregnancy; the entire episode was consumed by relationship drama between Ichabod and Katrina. Abbie desperately tries to follow up her ongoing warnings to try and keep Ichabod focused on mission, but Ichabod and Katrina’s romance overwhelmed the whole episode. Abbie was reduced to helping and supporting Katrina (playing nursemaid to her no less! There could be few more problematic images than Abbie being pushed into that role), her opinions and warnings overruled (literally) by the sudden addition of Katrina to the group which, in turn, pulled their whole focus from the actual mission to Ichabod and Katrina’s family issues. Abbie was sidelined, reduced and ignored, the storyline dragged away from any plot lines that actually involve her and reduced the supposed co-protagonist to a side character. And this isn’t the first time - season two, episode five brought us Mary, a woman from Ichabod’s past which led into a whole episode rescuing the eternal-damsel Katrina and focusing on Ichabod and Katrina’s relationship. Abbie was, again, rather surplus. In Season two, Episode two, again, we focused on Katrina’s captivity, saving her and Ichabod’s ongoing pining after her. As we noted in the recap, the group threw a lot of resources after Katrina this episode - Abbie’s repeated cautions and objections were ignored and she, again, became a supporting character in Katrina and Ichabod’s love story. This treatment of Abbie this season also follows a backdrop of the other POC being sidelined. In season one, Frank Irving was a prominent character who become more and more involved in the plot as the big secret was revealed to him. This looked promising, it looked like he was going to be an active participant in the story rather than, as so many POC are, promoted to obscurity. Not only did we see Frank regularly being involved in the plot line, the mystery and the action, but the plot caught up to him on several occasions. In fact, Moloch directly targeted Frank and his family - this seems like an odd thing to praise, but it meant Frank was deemed important enough for the bad guy to target - not as a random victim to be killed/discarded/cast aside but as someone both to target and be defended, as a character that was important enough to have this battle be the focus of several episodes. He has his own arc. Sure it wasn’t a long one, but he had his own arc, he was involved in the plot outside of that arc and he even played a prominent role in the spin off book. The end result of that arc was him being arrested - and come season two he is then moved into a mental institution and, while Abbie and Ichabod spend an incredible amount of time agonising over Katrina, barely a thought is spared for Frank’s predicament. In fact, the most notable contact they’ve had with him - especially after Henry snared him - was to use him as an excuse for Ichabod to contact his son. So they could save Katrina. Frank’s character has been sidelined, not just in screen presence but also importance both to the plot line and to Ichabod and Abbie personally. He is an afterthought, at best - and his family have disappeared entirely (taking with them the only disabled character as well). His replacement is Leena Reyes, and she’s not a bad character (in fact, again, she’s considerably better than many token bosses in these shows) and she is a Latina woman. But she doesn’t know the big secret of the supernatural, inherently making her presence in the story lesser. She quite simply cannot be part of the plot to anything like the extent that Frank was because of that secret. Maybe they will change that in the future but, at the moment, Reyes is inherently a background character and is incapable of becoming more. Yet another POC who has fallen by the wayside is Jenny. Again, in season one, Jenny was important and her interactions with Abbie was deep and complex as they tried to rebuild their highly damaged relationship, find common cause, forgive the past and move on united. They had to learn to respect each other’s skills, they had to learn to reconcile Abbie’s respect for law and order with Jenny’s suspicion of any kind of authority (that had hurt her so badly). They had a wonderfully involved storyline that was all about them - not about a man, not about any of the other characters - it was a storyline that focused on two Black women, two sisters and that is very very rare and important. Even Andy Brooks, an Asian character, the reluctant and often conflicted servant of Moloch, struggling to serve his master and still maintain his loyalty to Abbie has disappeared. He wasn’t always a great character, but he was a complex character, a conflicted character - a character whose conflicts themselves made up part of the storyline and made him a deeper character; other than Moloch and the Horseman himself, he was a recurring symbol of the enemy. But even this complex villain was removed after the first episode of the second season - and now team antagonist is made up of Henry (a White man) and Abraham - a much more humanised (and repeatedly head-ed) Headless horseman (and another White man). Which characterises this shift in scope - because not only have the numerous POC characters that made Sleepy Hollow so unique been severely de-emphasised, but this has been matched by an increase in prominence by White characters. Andy stepped back, Henry and Abraham stepped up. Jenny stepped back, Hawley stepped up. The personal dramas between Jenny and Abbie and even Abbie and Ichabod stepped back and Katrina’s storyline surged forwards. The very character of this show that made it so rare and so beloved by many fans, especially POC, has been eroded since season two began - the show is becoming Whiter; the POC are less prominent and less important and the White characters - new and old - are moving into the space they once occupied. This surprisingly and very appreciated racially diverse show is losing the very elements that made it so unique (and garnered it such a passionate following) in a sea of overwhelmingly White programming.